A representative body for Australian apple and pear growers is finding success with a new marketing campaign encouraging consumers to eat hail-damaged pears. 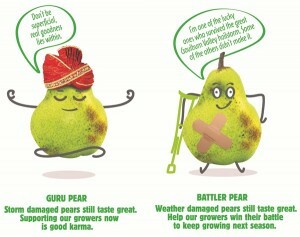 Called “Hailstorm Heroes”, Apple and Pear Australia Limited are using cartoon characters “Battler Pear” and “Guru Pear” to communicate that bruised and misshaped pears can still be eaten. Guru Pear’s message is “Storm damaged pears still taste great. Supporting growers now is good karama”. The campaign has seen Woolworths, Coles and IGA all agree to sell the damaged fruit. The marketing initiative was funded by Horticulture Innovation Australia using the apple and pear industry levy fund from growers and matching funds from the Australian Government. REPORT: What’s happening to cherries? Unilever has acquired UK tea brand, Pukka Herbs.